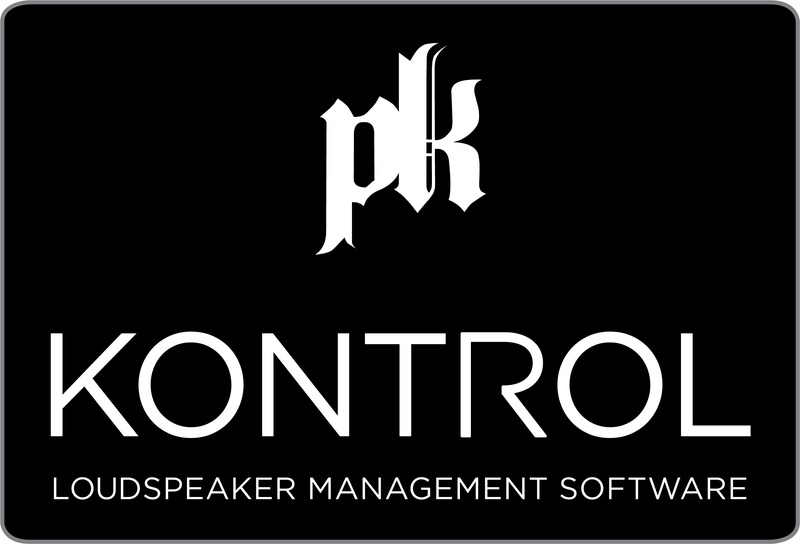 Following the success with our first iteration of Kontrol, Pk Sound is proud to announce the official release of Kontrol 2.1 - A loudspeaker management software and companion to PK Sound's flagship line array system, Trinity, as well as our new line of Gravity 218 and Gravity 30 subwoofers. Kontrol 2.1 equips engineers with powerful tools that allow remote control of both the vertical and horizontal directivity of the array, as well as access to key DSP parameters and real-time monitoring during operation. New features include the support for Gravity subwoofers, 6 band parametric EQ's, as well as visual feedback when manipulating Trinity's vertical and horizontal directivity. With Kontrol set up time is reduced and the ability to make precise adjustments quickly and easily, without the requirement of additional personnel, provides a new set of tools for sound engineers. Once the modules are flown, users can make significant remote sound field adjustments with the click of a button. Sound engineers can now adjust the direction of every module from front of house, increasing sensitivity for longer throw applications, narrowing the sound field to avoid reflective boundaries, precisely focusing the array into the audience, and reducing spill into adjacent areas. Kontrol interfaces with electronic actuators built into each module that allow inter-module and wave guide angles to be adjusted remotely. The software performs calculations to ensure movement of the array is within safety parameters while providing real-time feedback during and after movement is complete. By using inter-module communication, Kontrol automatically detects, arranges, and configures the line array with all modules represented in the correct order within the software’s virtual work space. Once activated, an engineer can quickly move on to aiming, tuning, and optimizing the sound system with total confidence that their work will be reflected accurately in the real world environment. Mapping physical array and subwoofer cluster configurations into a virtual workspace is often a tedious, manual process. Kontrol does this work for you in a matter of seconds. Sensors included in every module allows the Auto-Array feature in Kontrol to quickly map the physical module configuration into the virtual workspace, showing which module is in which array or cluster and in what order in relation to the other modules. Kontrol provides access to key DSP functionality as well as monitoring of the system during operation. The intuitive GUI makes it simple to detect when any DSP settings have been changed from their defaults. Unobtrusive, but distinctive notifications will allow the sound engineer to glance at their work space and have confidence that their system is configured as intended. PK Trinity-series modules acoustic properties are fully configurable with Kontrol's parametric EQ feature. Trinity features two sets of audio presets designed to compensate for different projection distances and array lengths. The High Frequency Compensation (HFC) filters are used to compensate for the effects of high frequency attenuation over long distances – these are configured to be used at distances of 75 and 100 meters. The Low Frequency Compensation (LFC) filters are used to smooth the low-end coupling that occurs when multiple cabinets are arrayed together. These simple to use features allow effective control to ensure every person in the audience receives consistent transparent sound quality. As line arrays are usually setup in pairs, Kontrol cuts array setup time in half by allowing users to link array pairs together for simultaneous configuration. Users can choose to link inter-module splay angles and mirror left/right array horn flare angles. To ensure simple and seamless communication between engineers and shop technicians, Kontrol allows users to set service flags for any module from a user interface that provides a functionality where electronic notes may be created and stored within module. The service notes provide seamless communication between the field and service teams, ensuring modules are properly maintained, saving critical downtime.